Our G6 culinary grade matcha powder is cultivated on the organic tea farms of Kyoto and Kagoshima. 100% pure, with NO sweeteners or additives. 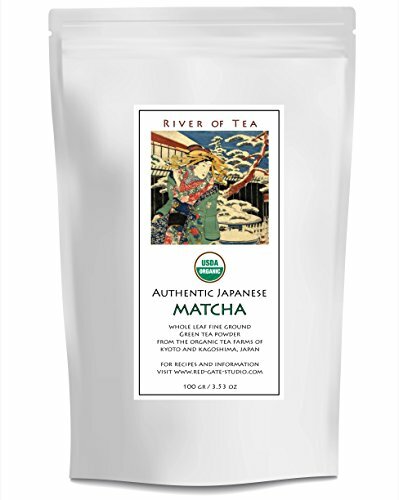 This Authentic Matcha is shaded for 3 to 4 weeks prior to being hand-harvested to reduce its bitterness and create that beautiful green color. This high quality matcha cultivation and harvesting technique comes from generations of Japanese Matcha Tea tradition, and now can be delivered right to your doorstep! Our Culinary grade matcha is summer harvested and ideal for making smoothies or lattes, baking, or using in other recipes because it is fresh, with a beautiful green color and excellent taste. As green tea lovers already know, pure matcha tea is nutritious and delicious! It has been used for many generations to promote an active lifestyle, help with weight loss, or as an anti-inflammatory supplement. Perhaps the most beneficial feature of green tea is the catechin known as EGCG. Some studies have shown EGCG to promote healthy bones, liver function, hair growth and dental health. River of Tea believes in bringing you the best green tea leaf powder packed with EGCG, so all you have to do is brew it or use it in your favorite recipe! Our Kyoto Matcha has JAS, USDA, EU, AB, and Kosher organic certifications. If for any reason our matcha green tea powder does not meet your expectations, simply return it for a full refund, no questions asked! We make it easy for you to try or compare our teas to any of our competitors. Discover Matcha Energy with this Genuine Green Tea Powder from Japan! If you have any questions about this product by River of Tea, contact us by completing and submitting the form below. If you are looking for a specif part number, please include it with your message.